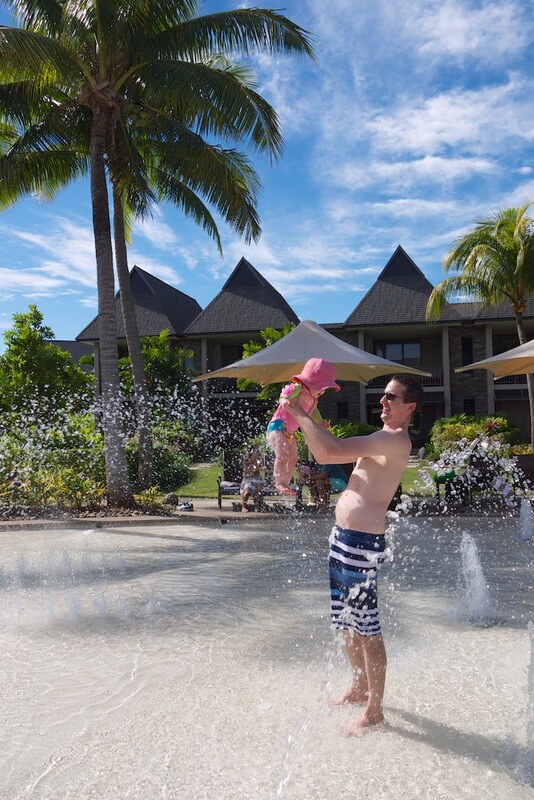 After our stay at the Sheraton Villas we were ready to move on – we’d got a bit bored of the food and activities on offer on Denarau, and were keen for a change. 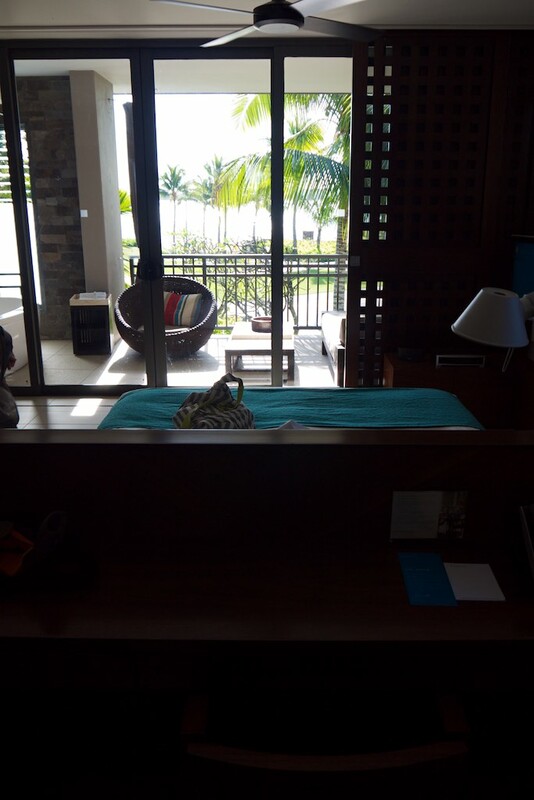 I had booked the InterContinental Fiji for 2 nights using a long-held stash of IHG Rewards points, at 30,000 points per room, per night, for 2 base-level Ocean View room. I had around 80,000 points in my account, so needed another 40,000 to top – this was accomplished using points + cash. Essentially this allows you to buy IHG Rewards points for 0.7c (USD) per point by booking a cancellable points and cash room at any IHG hotel, where IHG Rewards will sell you an additional chunk of points for the booking. The savvy of you know may know you can then cancel and get a refund of the booking in points to build up your balance if needed, but given I actually wanted to stay there was no need for me to do this. All up the additional cost was $280USD, and given room rates were about $300 per night per room, I thought this was an acceptable trade-off to use both points and cash on this trip. 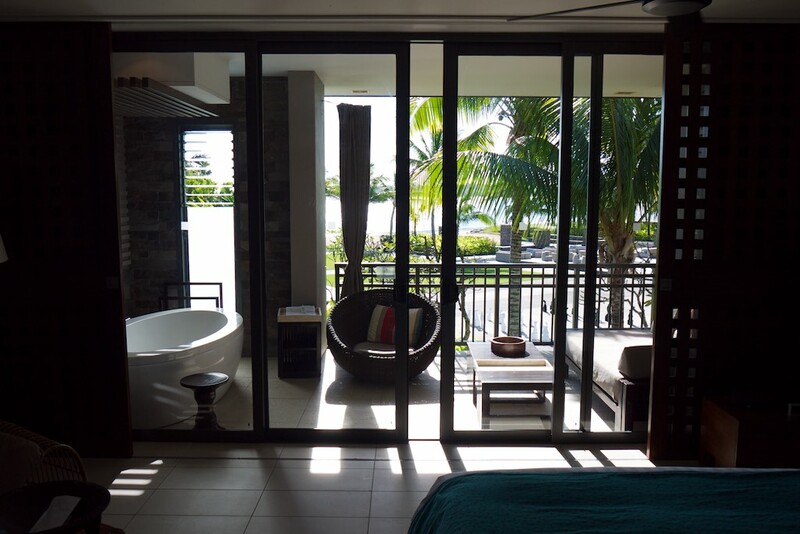 I’ve had a few false starts at trying to stay at the InterContinental Fiji, but every time I’ve dealt with the reservations team by email they have been fantastic, quoting me rates for Priority Privilege rates (that program has now ended, shame) or to use InterContinental Ambassador certificates. I’ve never had to explain myself twice despite what I would imagine are non-standard requests, so maybe they are used to people using vouchers and points to stay here. If you need to contact them, their email is [email protected]. 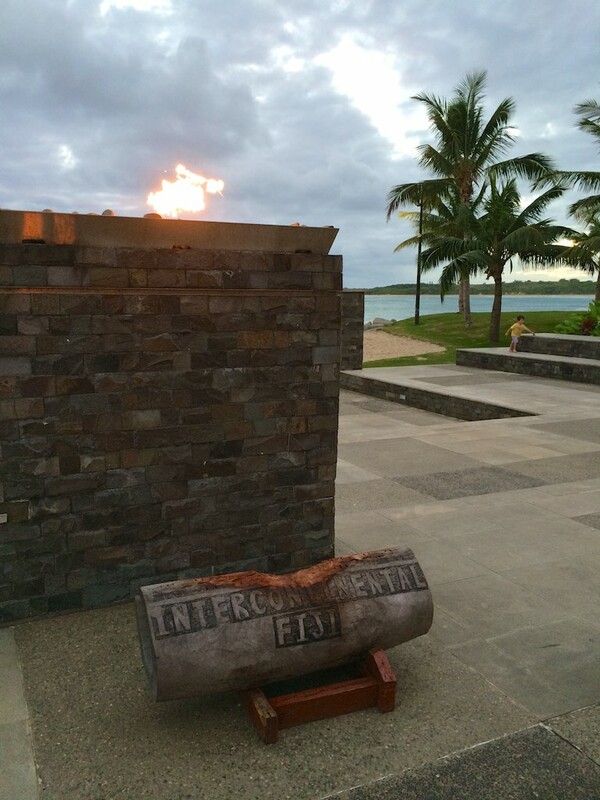 The InterContinental Fiji is on the Coral Coast, about an hour south of Denarau. We booked a taxi transfer from the Sheraton with two child seats which came without a hitch, and set off. 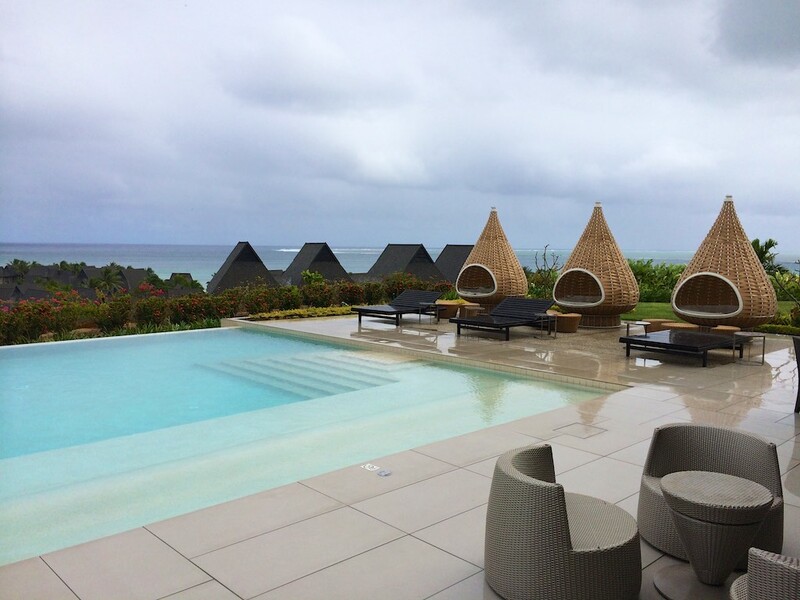 It felt like a fairly long-drive given the comparative slowness of Fiji’s roads, but on arrival we were greeted like old friends and checked-in swiftly. The resort is broken into the Club area which is high up on the hill overlooking the large area that the hotel occupies, while the main facilities and large Bures which house the non-Club rooms are all at sea-level spread out over a large area in front of the beach and the lagoon. Each Bure has two floors and four rooms on each floor, split into blocks of two which can connect. We were on the upper floor, which worked for us with small kids as they couldn’t run off if the doors were left open. We had booked one double room and one twin room, which connected with a dead zone between. 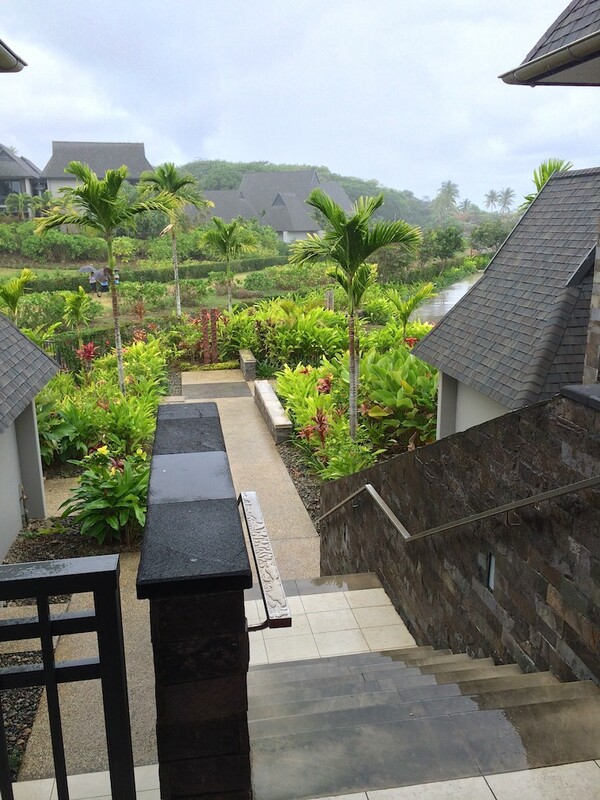 The interior of both rooms were modern and Fijian. 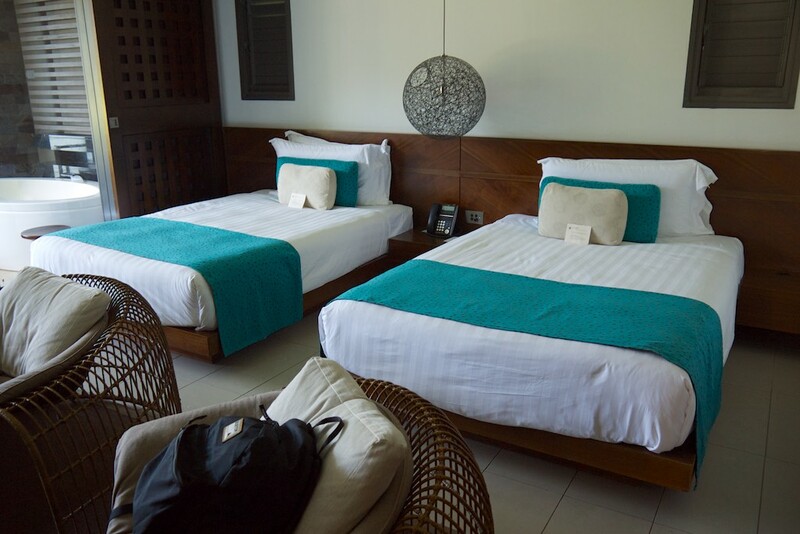 Each room has a main sleeping and living space, with the bed backed onto by a good size bathroom with separate shower, toilet and double sink. 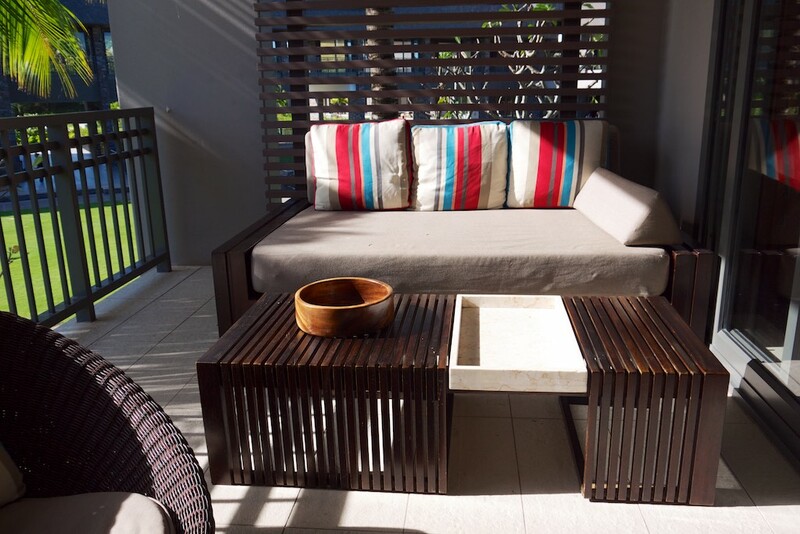 The bed was positioned to look out of the large balcony, which has a seating area, table and outdoor bath. 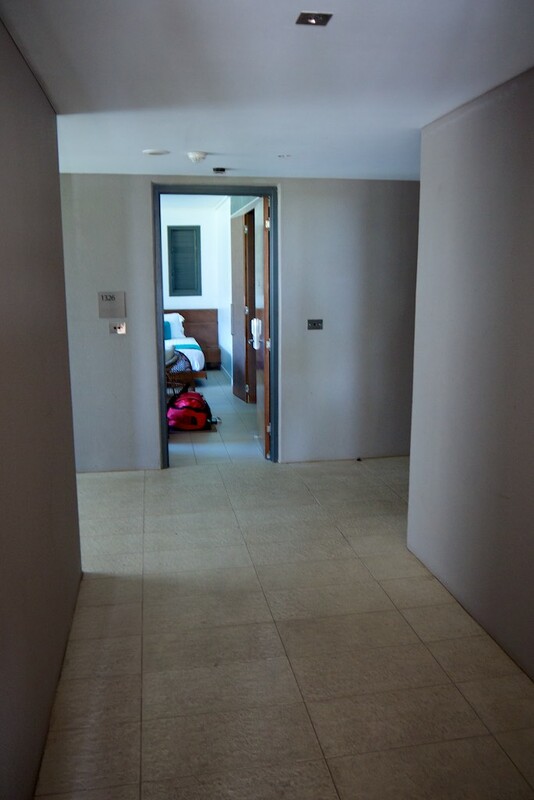 The rooms were about 5 metres from each other – this dead space was private to us but did mean that if you had young kids you would want to jar both doors fully open to ensure you could hear them in the night. 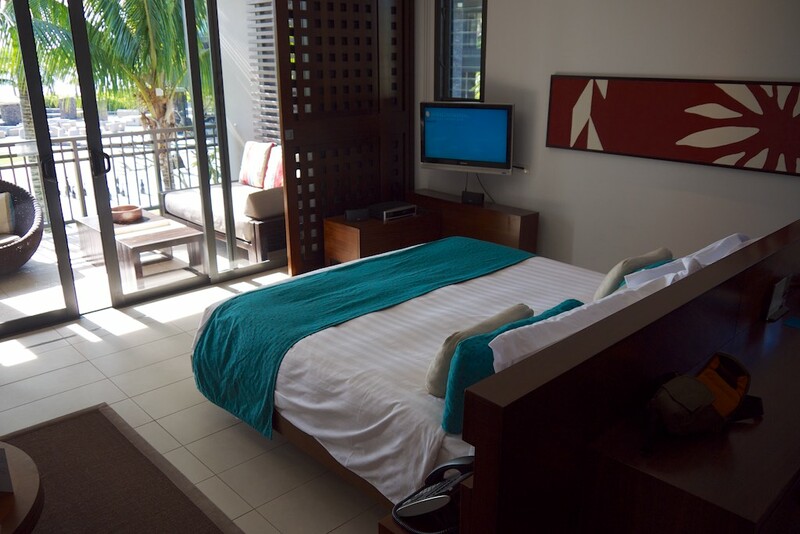 Onto the double room – the configuration and size was very similar, although the positioning of this room was much shadier, but with the same facilities as the double room. Unfortunately this meant that all the associated noise of the bar and people in the courtyard below floated up to us in the evenings, including live music and sport. We called to ask them to close the open doors to the bar, which the staff were great about and helped a lot with the noise. 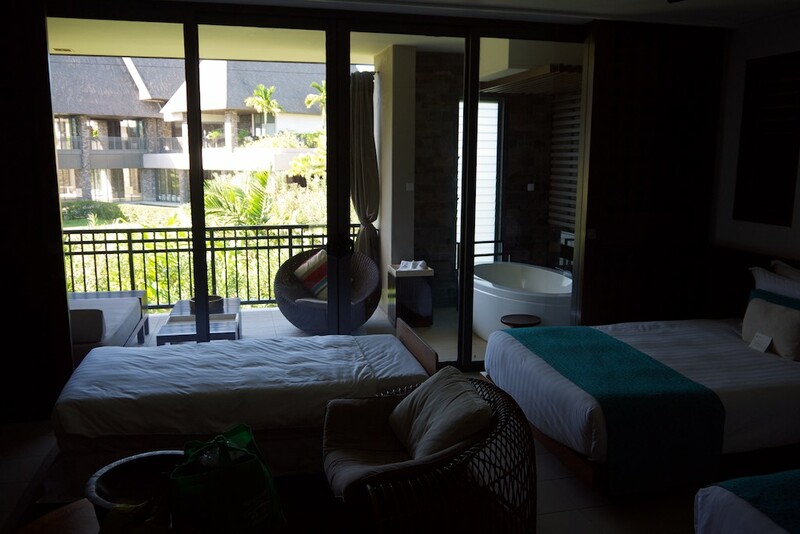 I actually loved these rooms – and they were possibly the worse rooms in the resort given their proximity to the noise of the main building. Having said that, it made it easy to go grab breakfast and dinner. 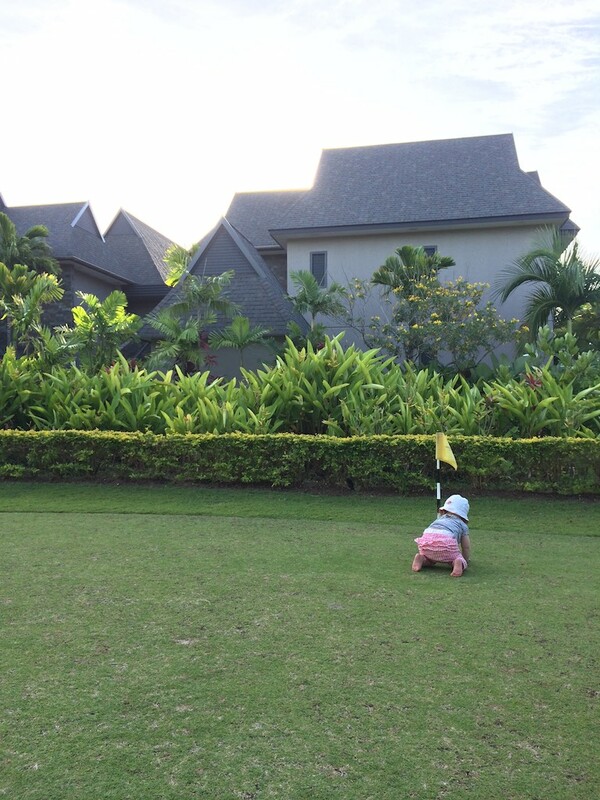 If you were located up the far end of the resort you may have wanted to hitch a ride on a golf-cart (and very common occurrence) to speed things along. 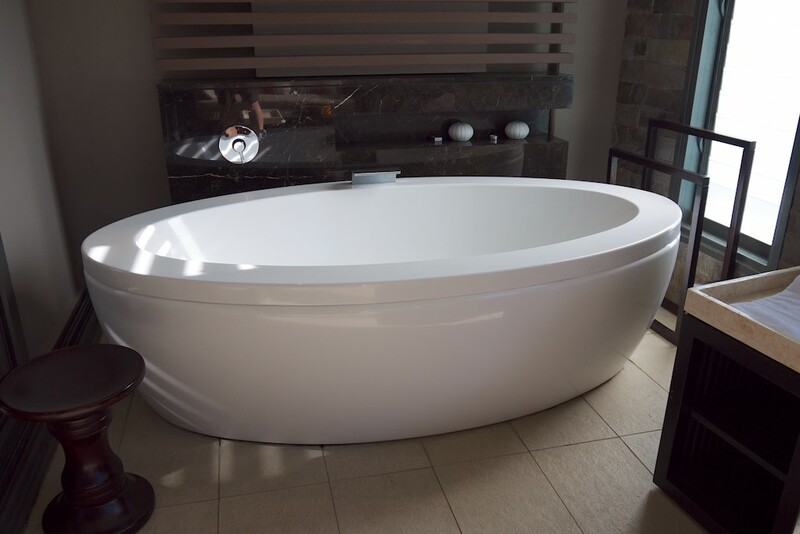 The rooms were spacious and comfortable, the bathrooms too. 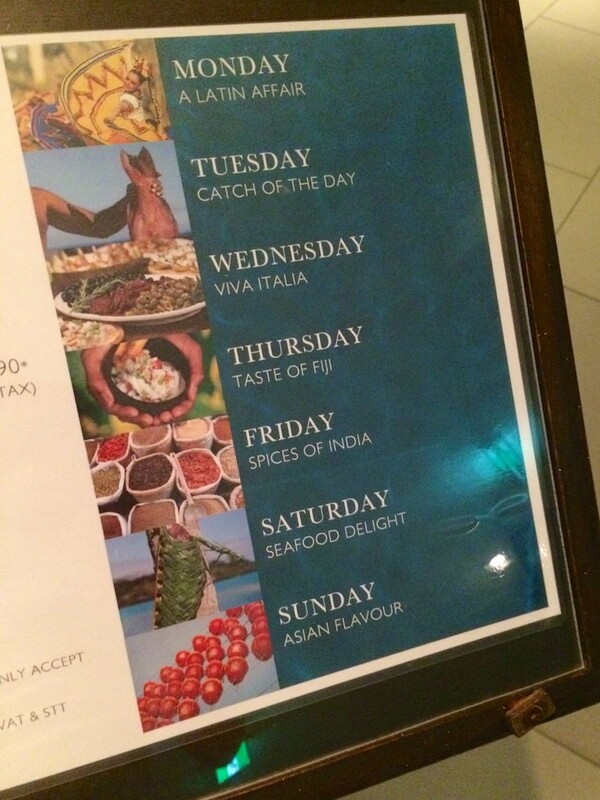 They were what I would expect from an InterContinental. 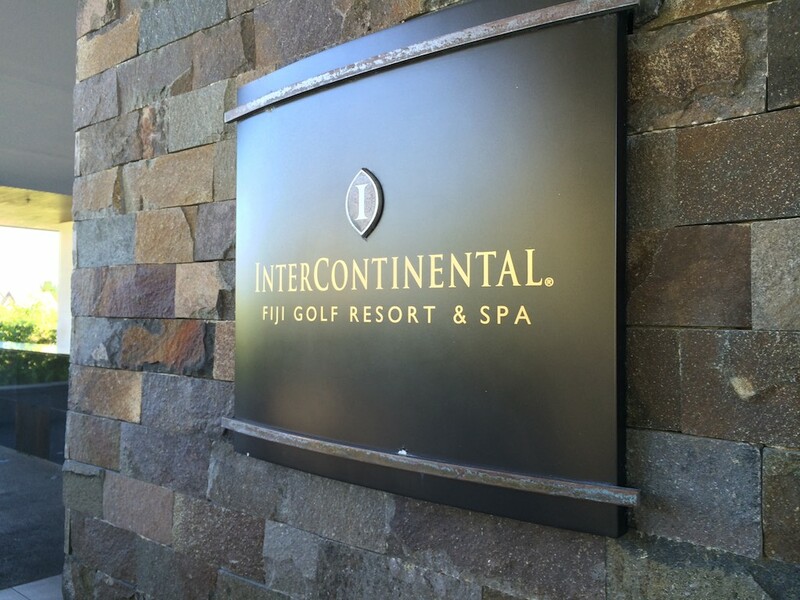 The primary drawcard of the InterContinental Fiji in my book is Natadola beach, which it seems like the InterContinental dominates – certainly there’s no other hotel on the beach, and the hotel frontage runs most of the way along the beach and into the lagoon at the other end. 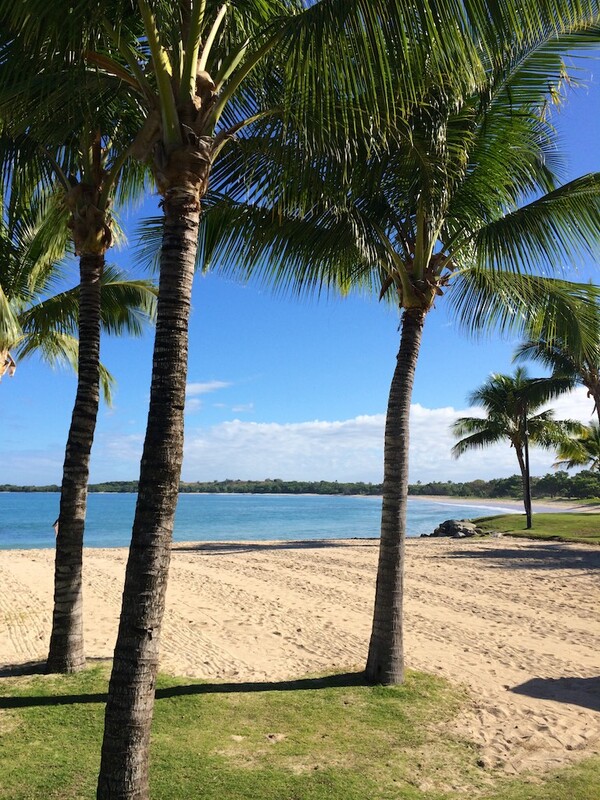 It’s a stunning beach. 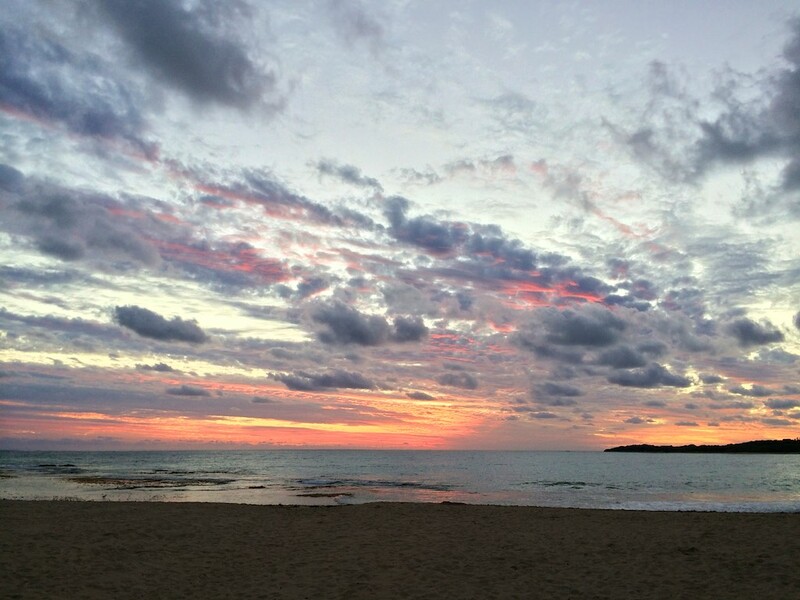 The beach is also oriented perfectly for beautiful sunsets. 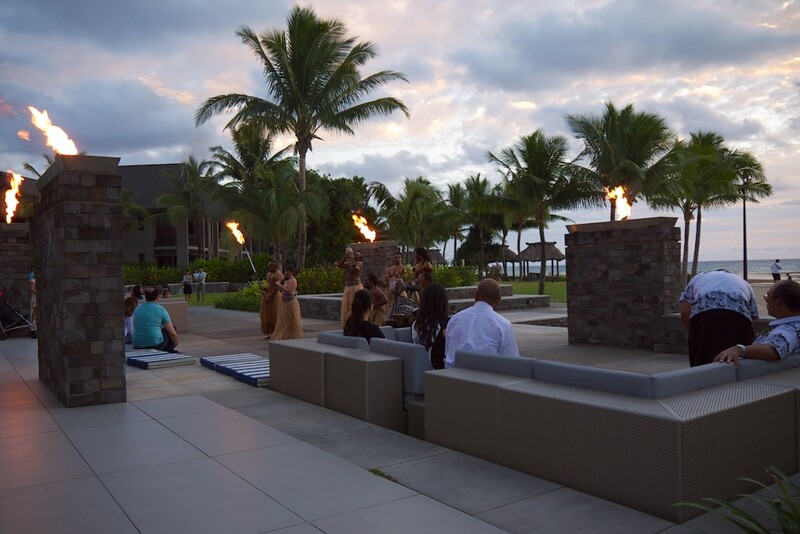 Before sunset, around 6pm each day near the beach and main bar, there’s a Fijian dance, music or ceremonial show. This was always entertaining, and passionately and professionally performed. We really enjoyed it. 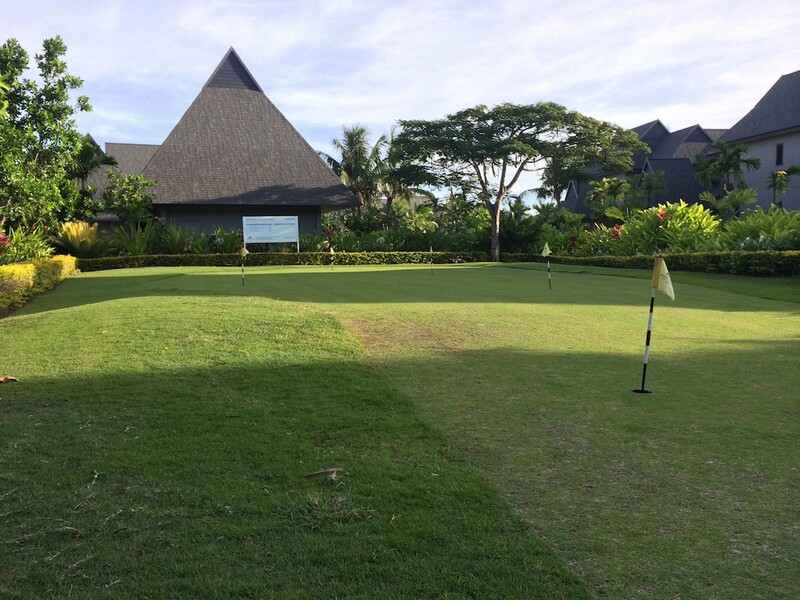 Given the Hotel’s connection to Golf too, there’s also a small putting green guests can practice at (or kids can enjoy crawling around). 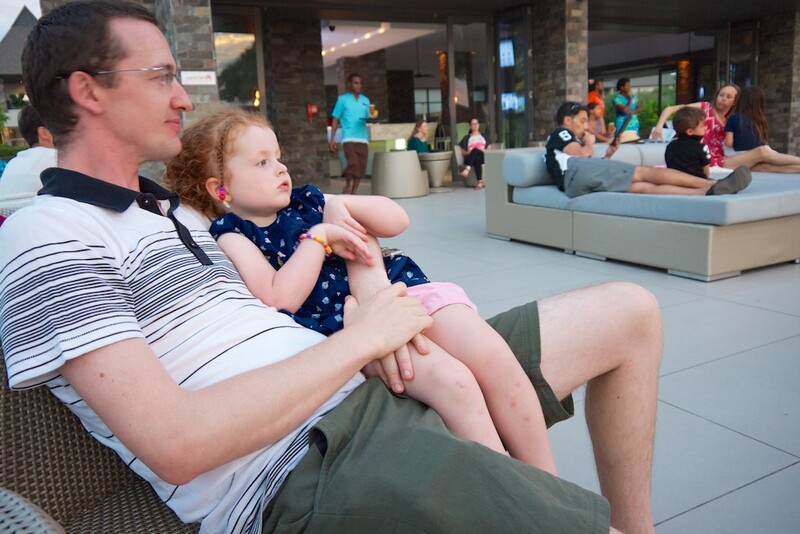 The resort (not including the Club) has two pools – one adults only on the beach-front, and another large pool surrounded by rooms and Bures for everyone. 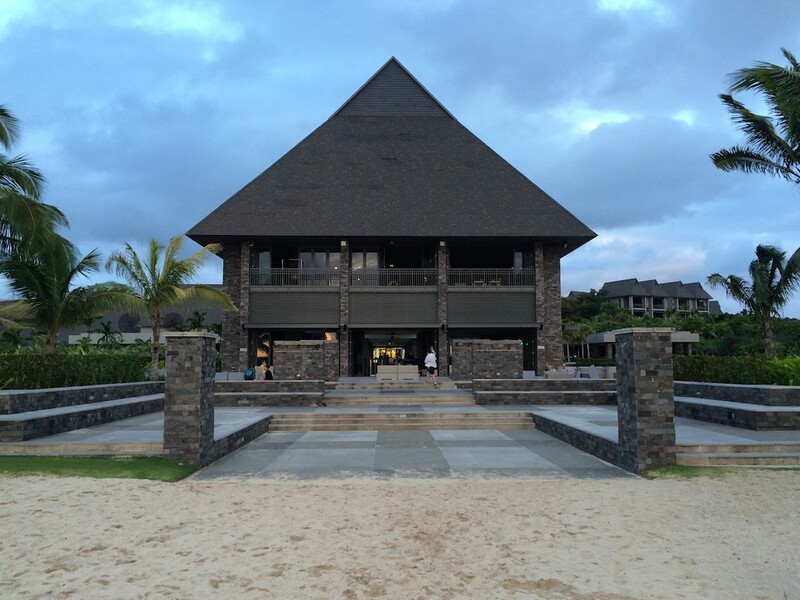 Both pools are split by a bar / restaurant. I wouldn’t want to have been in a room near the pool though – at least for this trip, with older kids it could be great. My other half had a great glass-bottom boat experience arranged by the water sports team, which our 3 year old loved too. 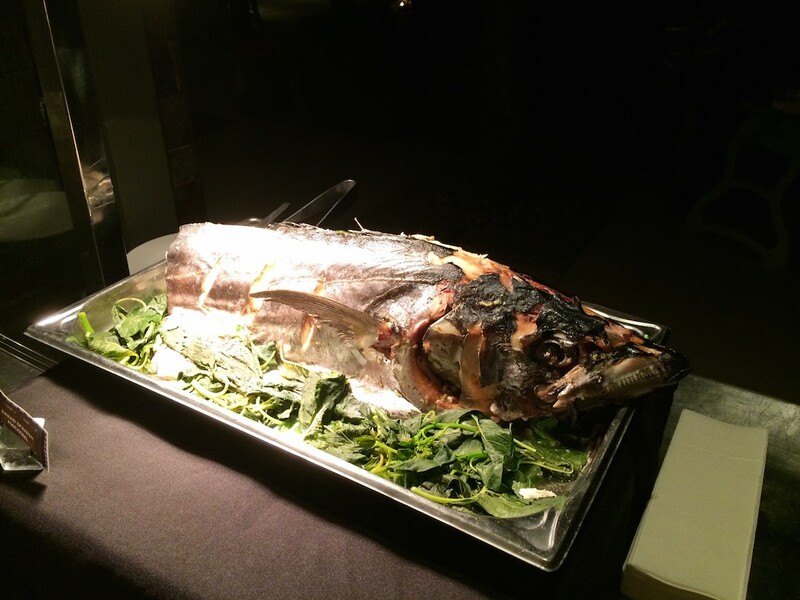 One of the biggest wins about staying at the InterContinental was the ability to use all the Priority Privilege dining benefits to reduce the cost of food. This brought down the cost by more than half, with kids eating free and 50% off 2 adults dining – plus a some other room and breakfast credits. It’s a shame this program has now been discontinued. 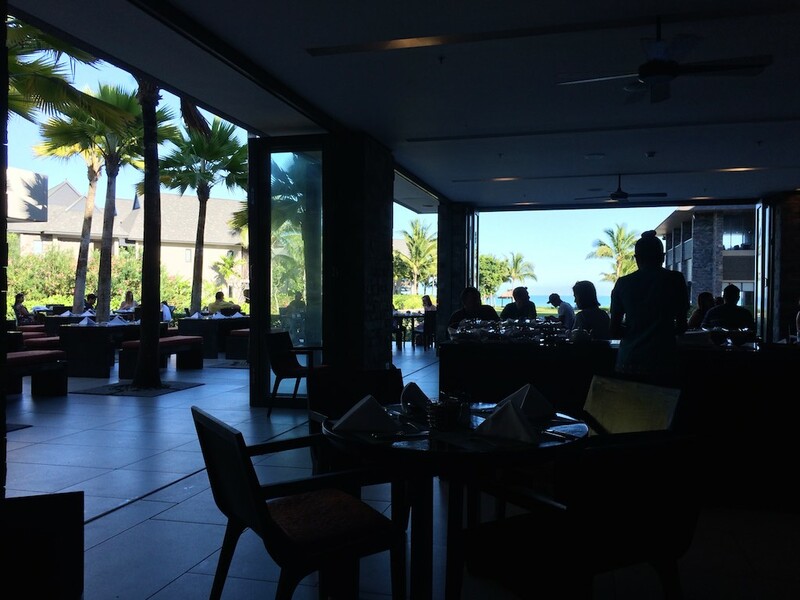 There’s nowhere else nearby to eat at, so you’re locked in to what’s on offer – but thankfully I generally found it very good and of better quality than that at the Sheraton Denarau. 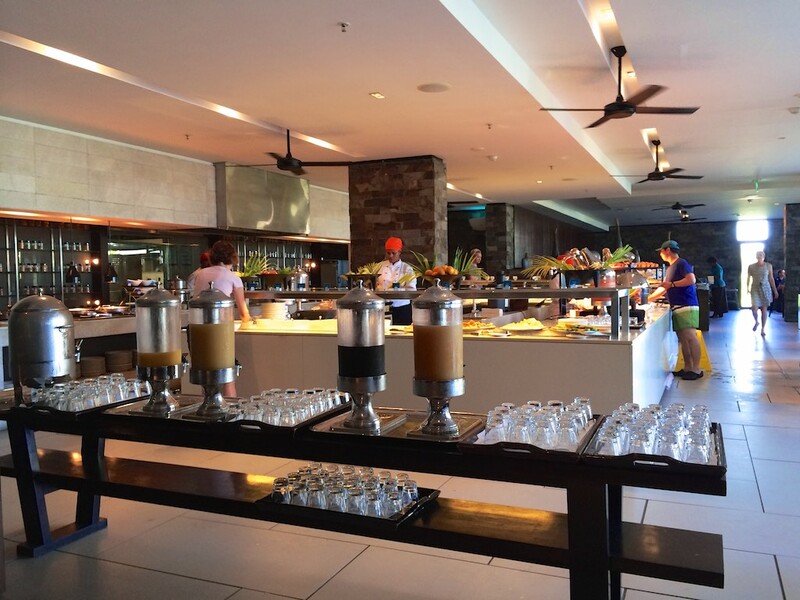 The dining area is very open and of a large scale, like the rest of the resort facilities really. Breakfast was a huge spread and I enjoyed sitting out in the fresh air. 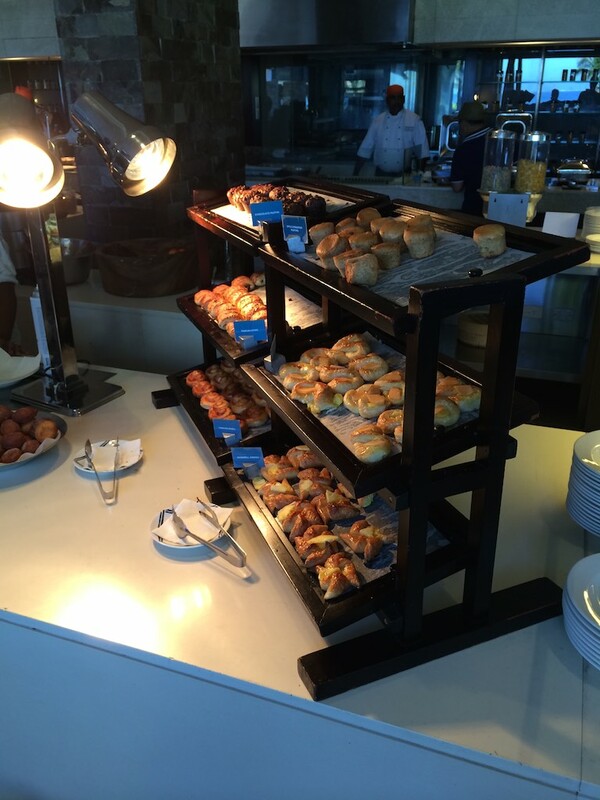 The buffet Dinner was generally themed each night, with a range of common options plus the themed food on offer. It was all good quality, and seemed to make the most of local ingredients. 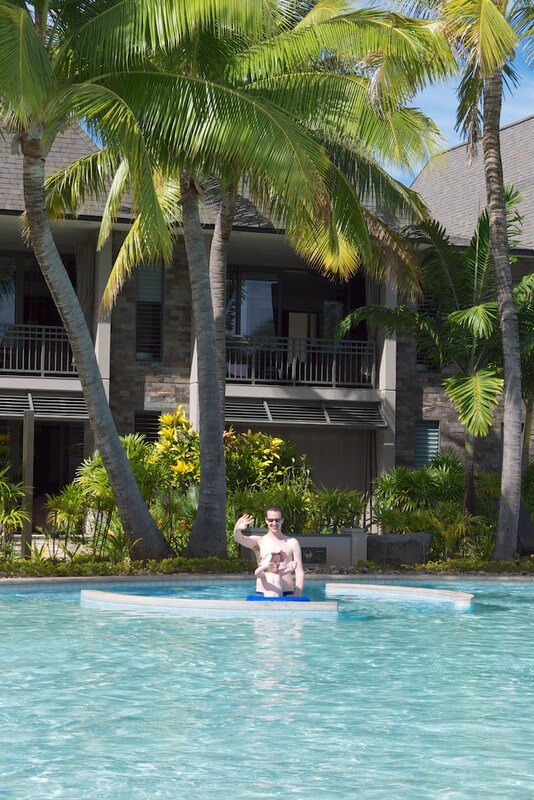 The InterContinental Fiji Resort was grand in proportion and space, and I felt more relaxed leaving the place than when I arrived – the mark of a good holiday. 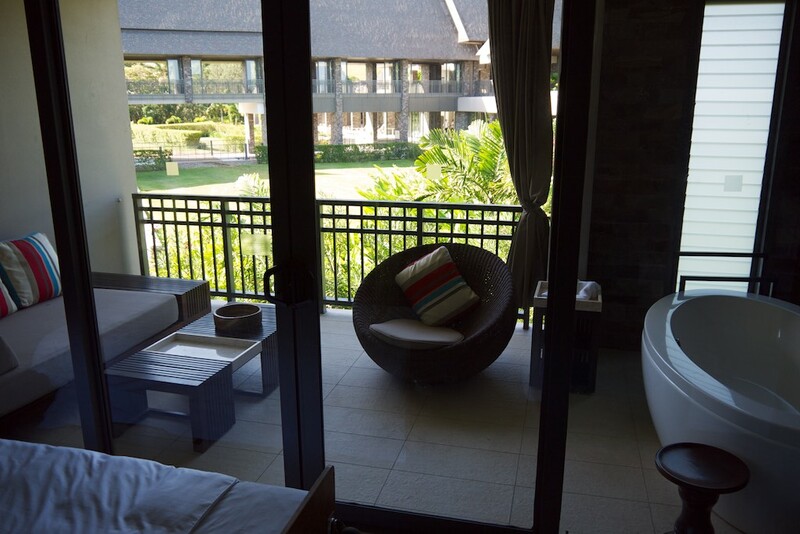 We actually enjoyed the place so much that we decided to change our return flight home (thanks to the flexibility of points) and stay an extra night in a 2 bedroom Club Suite – a separate review on that to come in the next post. Nice review of the IC Fiji. Great property. 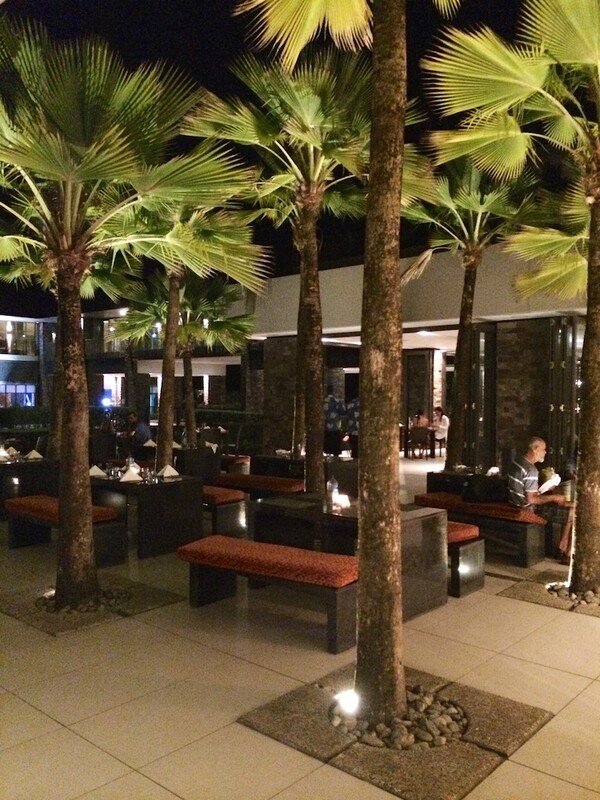 You do point out that the Priority Privilege program is being wound up, but I was surprised that you haven’t referred to the replacement program that IHG is rolling out across the region – Dining Rewards. 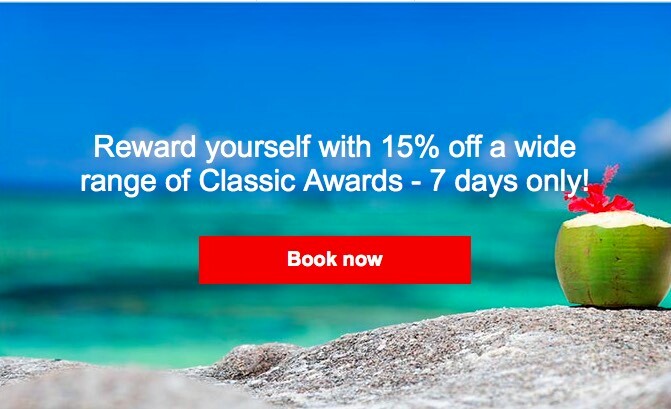 See ihgdiningrewards.com. Some changes in benefits but you get one free night in any IHG hotel worldwide. Worth checking out. Thanks! Indeed, I did miss that and have been meaning to do a once-over of IHG Rewards in an upcoming article. Thanks for the reminder.